A war of words has erupted between two senior Akali leaders eyeing the Batala Vidhan Sabha, which the SAD, albeit unofficially, has taken away from the BJP. The Kahnuwan seat, represented by Education Minister Sewa Singh Sekhwan, has been dissolved after delimitation. The High Court verdict quashing the notification that debarred Sehajdhari Sikhs from being voters in the Shiromani Gurdwara Parbandhak Committee (SGPC) elections has serious implications for the Shiromani Akali Dal (SAD) that has been riding high on its recent victory in the SGPC polls. 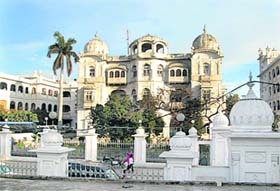 By setting aside the Union Home Ministry's 2003 notification debarring Sehajdhari Sikhs from voting in the Shiromani Gurdwara Parbandhak Committee (SGPC) general election, the Punjab and Haryana High Court has restored a right that the community members had been enjoying since the inception of the institution 86 years ago. Having won as president of the Punjab Youth Congress with a huge margin of over 6,241 votes, Vikramjit Singh Chaudhary is now likely to be allotted the Congress ticket for the Adampur assembly constituency that he has been vying for since the past over two years. Punjab has justifiably been acknowledged as the pioneer in the formation of coalition governments in the country. Of the 30 governments under different Chief Ministers in the state since 1952, at least 12 had MLAs from more than one party on the treasury benches. The last two coalition governments in the state, both headed by SAD chief Parkash Singh Badal, lasted full terms in office. 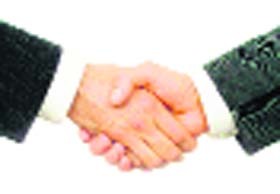 This constituency, that has seen a tug of war between two prominent families headed by Randeep Singh and Raja Narinder Singh, has been declared reserved, meaning that new candidates would be fielded from here this time. Neglected since the past over four years in terms of sanitation and civic amenities, the constituency has been declared reserved. The seat would see an open contest with a majority of ticket aspirants seen as outsiders. The ambitious National Food Security Bill, cleared by the Union Cabinet on Sunday night, could spell the death knell of the SAD-BJP government’s very own atta-dal scheme. With the proposed food Bill, seeking to provide rice and wheat at highly subsidised rates, much less than the rates at which Punjab provides food to the poor, the atta-dal scheme is likely to be rendered redundant. The ruling Shiromani Akali Dal party has summoned a meeting of its core committee at CM Parkash Singh Badal’s residence in Chandigarh on Thursday evening to discuss shortcomings in the Moga rally and other political issues. The Shiromani Akali Dal (Longowal) headed by Surjit Kaur Barnala will continue to be a part of the Sanjha Morcha. “We are a part of the Morcha and will continue to be so”, said Baldev Singh Mann, a senior leader of the SAD (Longowal). He said there had been a minor misunderstanding with Morcha chief Manpreet Singh Badal. Chief Minister Parkash Singh Badal, terming defection by political leaders as betrayal of the people, described these as a “political crime.” Badal, who inaugurated the tehsil office, coop bank and a government quarters complex and laid the foundation stone of home for cancer patients and their attendants, said Jagbir Singh Brar and Kushaldeep Singh Dhillon had left the Shiromani Akali Dal (SAD) to form the PPP and now the PPP to join the Congress. Days after Kushaldeep Dhillon, PPP’s founding member and former MLA from Faridkot, joined the Congress, a group of Congress workers today staged a dharna to express their displeasure against the party decision. But another group of Congress leaders in Faridkot celebrated the party decision, saying it would further strengthen the party. The Punjab Government's much-hyped and widely advertised scheme, the Saanjh, initiated in 25 police districts of the state, has become white elephant for the district police due to paucity of funds to meet its daily expenses. The head of a village in Muktsar district of Punjab, Baljinder Singh, today appeared before the National Commission for Women (NCW) to reply to the charges of slapping a female teacher seeking regularisation of services in the state recently and is said to have confessed to his mistake. A day after two Education Guarantee Scheme (EGS) teachers slit their vein to intensify their protest against the State Government demanding regular jobs, Chief Minister Parkash Singh Badal today assured them to look positively into their demands. With the implementation of the Mata Kaushalya Kalyan Yojna a few months back by the Department of Health and Family Welfare, Punjab, there has been a tremendous rise in number of women preferring to get their deliveries done at the government hospitals in Patiala district. Any child born in any government or other hospital accredited by the Government will be given free treatment for 30 days after his/her birth in case the baby falls sick. This facility to the newborn infants will be provided under the Janani Shishu Suraksha Karyakaram of Ministry of Health and Family Welfare, the Government of India. 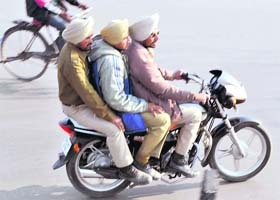 Ludhiana emerged as the coldest place in the region as the minimum temperature plummeted to 2.7 degrees Celsius. Dense fog conditions also prevailed in some parts of the Punjab and Haryana states reducing the visibility to 200 meters or less. Even after more than six months, the PRTC management has not released the payment to the bus owners under the km-scheme and due to which many of them refused to ply their buses on the road. Moreover, the PRTC is imposing a fine on the buses, which are getting less booking. The employees of Punjabi University, Patiala, have got New Year's gift in the form of house rent and phone allowance. In a Syndicate meeting, the authorities approved the house rent and phone allowances for the university employees on the pattern of the Punjab Government. Qadian MLA Lakhbir Singh Lodhinangal, who created a flutter when he boycotted a function presided over by Chief Minister Parkash Singh Badal recently, and Minister for NRI Affairs Balbir Singh Bath are the three senior SAD leaders eyeing the Batala seat. The erudite Bath is keeping his cards close to his chest although he admits that he is a claimant for the party ticket from Batala. The Sri Hargobindpur seat that he represents has been reserved post-delimitation. What is rankling the SAD rank and file are the virulent verbal attacks launched by Lodhinangal against both Sekhwan and Bath. Parkash Singh Badal phoned Lodhinangal last evening, instructing him to contest from Qadian, but he refused to abide by the CM’s diktat and is adamant on contesting from Batala. “Post-delimitation, a majority of villages in Qadian have been attached either with the Fatehgarh Churian or Batala seats. I remained the Batala Improvement Trust Chairman from 2003-2006 and most of my loyalists like HS Toor, Chairman of the Batala Market Committee, KS Rozy, Chairman, Batala Block Samiti, and Kashmira Singh, former Chairman of the Batala Block Samiti, have created a substantial vote bank in Batala,” says Lodhinangal. He says that 29 Qadian villages have been shifted to Batala and 103 panchayats attached to the nearby Fatehgarh Churian. “Why can’t they adjust me either in Batala or Fatehgarh Churian,” he asks. On the other hand, Sekhwan claims that post-delimitation, 30 villages in his old Kahnuwan seat, including his own village, have been attached with Batala. His son Jagrup Sekhwan claims that his family has so many contacts in Batala that his father is sure to win the seat, if allotted. 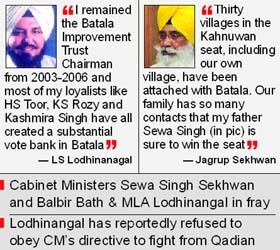 Lodhinanagal says that more than a 100 villages from Sekhwan’s old constituency of Kahnuwan have been shifted to Qadian. “Moreover, he has been disbursing grants and distributing bicycles among schoolgirls in Qadian. Actually, Sekhwan is afraid of Member of Parliament Partap Bajwa as Qadian is Bajwa’s stronghold,” he maintains. Bath, whose family has been in Batala since 1958, says that his sacrifices for the party cannot be ignored. “ I was jailed for nearly a year during the Dharam Yudh Morcha. If my old constituency of Sri Hargobindpur has been reserved, it does not mean I should be ignored for the party ticket from Batala,” he maintains. The High Court verdict quashing the notification that debarred Sehajdhari Sikhs from being voters in the Shiromani Gurdwara Parbandhak Committee (SGPC) elections has serious implications for the Shiromani Akali Dal (SAD) that has been riding high on its recent victory in the SGPC polls. The verdict on the eve of Vidhan Sabha elections would dent the "panthic agenda" that the SAD had adopted recently. The verdict has been widely acclaimed by the Congress leadership that has been accusing the SAD of using its influence in the NDA Government in 2003 barring Sehajdhari (clean shaven) Sikhs from voting in the SGPC elections. Punjab Congress president Capt Amarinder Singh has said that the "Badals stood exposed" and his stand that the move was a "deliberate mischief by the SAD to capture power and misuse funds of the SGPC had been vindicated". He said the judgment would go a long way in preventing the misuse of political power that led to denial of voting rights to about 65 lakh Sehajdhari and others Sikhs. According to legal experts, the High Court judgment does not automatically lead to quashing of the September 18 SGPC polls, nor does it automatically lead to the dissolution of the newly constituted SGPC general house. Gurdwara Election Commission Chief Commissioner Justice HS Brar said, "The copy of the judgment has not reached the Commission so far and without reading and analysing it, it would not be possible to comment upon it or on the implications it has on the SGPC polls." Supreme Court Lawyer HS Phoolka says the Sehajdhari Sikh Federation would have to go back to the High Court to seek dissolution of the house or the SGPC would have to approach the apex court to challenge the high court ruling. Notably, the SGPC general house was constituted on December 5 with Amritsar Deputy Commissioner presiding over the first meeting where 170 elected members co-opted another 15, besides including six Sikh head priests, thus, taking the total strength of the house to 191. But before the house constitution could be notified by the Union Government, the HC verdict has stalled all further proceedings, including the election of next SGPC president. 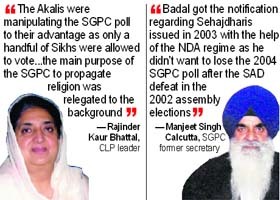 Congress Legislature Party (CLP) leader Rajinder Kaur Bhattal has alleged that “the Akalis were manipulating the SGPC elections to their advantage as only a handful of Sikhs were allowed to vote and with political interference by SAD, the real motive of the SGPC of propagating the religion was relegated to the background”. She has demanded dissolution of house and holding of fresh elections. In the days to come there would be a debate on the definition of a Sikh. The Sikh Gurdwara Act, 1925, is silent on the definition of a Sehajdhari Sikh. This issue is, however, pending in the Supreme Court in another case filed against the judgment of the Punjab and Haryana High court wherein a Sikh has been defined. Now, another issue that needs to be resolved is the definition of a "Sehajdhari Sikh" that may have to be incorporated in the proposed All-India Sikh Gurdwaras Act. It was only in the last two SGPC elections (in 2004 and 2011) that the Sehajdhari Sikhs stood alienated from electing members to the body that has come to be known as "Mini Parliament" of Sikhs. The term Sehajdhari Sikh finds no mention in the subsequent Acts approved for the Delhi Sikh Gurdwara Act or the Acts that govern Takhts at Hazur Sahib (Nanded) or Patna Sahib; it was incorporated in 1959 in the original Gurdwara Act, 1925, by including Section 2(10-A). The issue is being debated since the 1930s with the Sikhs divided over whether or not to include the Sehajdharis as SGPC electorate. And the only time a "Sehajdhari Sikh" got elected to the SGPC house was in 1939 when Bhai Khushi Ram won from Multan. Initially, those who were born in non-Sikh families but subsequently took to Sikhism came to be known as Sehajdharis. Their count used to be large earlier as there was a general practice among the Khatri or Arora Hindu families to make their eldest son embrace Sikhism. But post-Partition in general and after the re-organisation of Punjab in 1966 in particular, their count started dwindling. From thousands in the 1940s, the Sehajdharis' count came down to a few hundred in the early 1970s when the issue of debarring them from voting figured in the SGPC general house. However, the eruption of secessionist violence in the late 1980s put the issue into cold storage before it was revived towards the end of the century. A resolution adopted by the general house subsequently got endorsement of the NDA government at the Centre, thus depriving the Sehajdharis the right to vote in the 2004 general house elections. The notification issued in 2003 was immediately challenged. But in the absence of a uniform and acceptable definition of a "Sehajdhari Sikh", the issue could not be resolved. During the first 12 (of the total 14) SGPC elections, the "Sehajdhari Sikhs" exercised their franchise. The word "Sehajdhari" finds no mention either in any of the Sikh granths or even the Sikh Rehat Maryada. 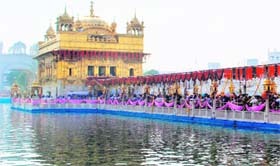 In 2008, when the issue of defining a Sikh was taken up by the Constitution Bench of the Punjab and Haryana High Court in Gurleen Kaur vs SGPC case, the term Sehajdhari figured nowhere though references were made to Amritdhari" (baptised) Sikhs, non-baptised Sikhs and "Patit" Sikhs (those who have shorn or plucked hair). The Bench then concluded that only those who maintain "Sikhi swarup" and follow the Sikh Gurus, Guru Granth Sahib and do not believe in any other religion or faith can be considered as Sikhs. At the time of Gurleen Kaur case, the SGPC had submitted an affidavit defining a "Sehajdhari" Sikh. It was, however, withdrawn later following objections from various quarters. While "Sehajdharis" maintain that they follow Sikh tenets, they did not agree to the definition of the SGPC that believed that "sehaj" (slowly) "dhari" (adoption) was for those who slowly moved on the path of Sikhism. Another difference of opinion between Sehajdharis and the SGPC had been over "Patit" Sikhs. Some believe that those who deviate from the "rehat" after getting "baptised" were Patits. The Sehajdharis, however, are of the belief that any non-baptised Sikh who cuts or plucks hair was a Patit. Vikram has the advantage of being the grandson of former minister Master Gurbanta Singh, son of former minister Chaudhary Santokh Singh and nephew of former minister Chaudhary Jagjit Singh. His mother Karamjit Kaur retired as DPI, Colleges. Vikram, 34, claims that his victory is a win for the Capt Amarinder Singh camp. “I was actively involved in the membership drive. My involvement as president of the DCC (rural) has perhaps worked in my favour,” says the media-savvy youth leader. In the past three years, he has time and again pointed out the problems in the implementation of the MNREGA scheme. He had organised a protest, claiming that the flagship programme of the Congress was not being implemented by the SAD-BJP coalition in letter and spirit. He had then been detained by the police for showing black flags to Deputy Chief Minister Sukhbir Badal. “While just 94 households in Adampur got a job under the scheme three years back, there are over 2,000 beneficiaries as of now”, he claims. Unlike his father, Vikram sports a turban, usually pink. A graduate in business management from England, he is known in political and social circles for his pleasant demeanour. In Adampur, Vikram is trying for the party ticket against his cousin Surinder Chaudhary. After the seat was declared reserved, sitting Akali MLA Sarabjit Makkar did not work much in the area and shifted his interest to Kapurthala from where he plans to contest this time. Makkar’s lack of interest and the fact that his nephew Prince Makkar is behind bars in the hotelier Gikki Sekhon murder case may work to Vikram’s advantage. Pawan Tinu, the most likely SAD candidate, is facing opposition from within the party. Now as the state heads for its 14th elections to the assembly, at least two combines, the ruling SAD and the BJP and the Sanjha Morcha comprising the Peoples’ Party of Punjab, the SAD (Longowal) and the Left parties are in the forefront of the battle of the ballot. The history of “coalitions” in Punjab is as old as the first assembly elections in 1952. Interestingly, the key participant in each coalition has been the SAD. It entered into a partnership with the Congress in the 1952 and the 1957 elections and subsequently partnered with the erstwhile Jana Sangh and now the Bharatiya Janata Party (BJP). When the country was swept by the JP wave, the Akalis reached an alliance with the then Janata Party. The Congress was able to win the elections in Punjab in 1952, 1957 and 1962 after independence mainly because it had won over the Akalis, its main Opposition party, at least for the first two elections. First in 1948 and again in 1956 the Akalis Dal merged with the Congress, but walked out of the “friendship pact” in March 1960 with the then Akali leader Master Tara Singh directing his party men who had joined the Congress in or after 1956 to return to the party fold. The reason given was interference by the Central Government in the religious affairs of the Sikhs. This allegation has since been a tool in the hands of the Akalis for Congress-bashing. Another reason for the breakup with the Congress in 1960 was the ruling party’s opposition to the Punjabi Suba. Of the 24 Akali MLAs in the Congress, only five returned to the Akali Dal. The Akali Dal-BJP (earlier Jana Sangh) pact has probably come to be known as the oldest and strongest alliance in contemporary Indian politics. No other coalition has weathered so many political storms since March 27, 1970, when Badal became CM for the first time. The first coalition government was headed by Justice Gurnam Singh. In the 1967 elections, no party got a clear majority, the Congress with 48 MLAS being the single largest party. However, the then Akali Dal (Sant group) managed to get all the non-Congress parties and Independents to form a government. On March 8, 1967, the first non-Congress government in Punjab, the United Front ministry headed by Justice Gurnam Singh was sworn in. It had Jana Sangh as a partner. The CPI joined the government later. The government collapsed on November 24 the same year leading to the second coalition and minority government headed by Lachhman Singh Gill. His government, too, did not last long. It was followed again by an Akali-Jana Sangh coalition government headed by Justice Gurnam Singh from February 17, 1969 to March 27, 1970. In March, 1970, the Akalis pulled down the government and elected Badal as the Leader of its Legislature Party. Gurnam Singh tried to win over the Congress support to remain in power but failed. On March 26, he resigned as CM. The same day, Badal was sworn in as the third head of a coalition government. It was on his recommendation that in June 1971 that the assembly was dissolved and the state was for the second time in three years placed under President’s rule. It was during this period that the coalition moved from multi-party alliance to a more stable two-party coalition. This constituency, that has seen a tug of war between two prominent families headed by Randeep Singh and Raja Narinder Singh, has been declared reserved, meaning that new candidates would be fielded from here this time. Neglected since the past over four years in terms of sanitation and civic amenities, the constituency has been declared reserved. The seat would see an open contest with a majority of ticket aspirants seen as outsiders. The constituency has 157 villages with a Jat Sikh population of almost 48 per cent. The ST, SC population is an estimated 28 per cent. Both sections of voters will play a key role in the outcome of the poll results. The sitting Congress MLA, Kaka Randeep Singh, being in the Opposition, could achieve little in terms of development. Those in the fray include Congress leaders Amarinder Singh Libra, son of Fatehgarh Sahib MP Sukhdev Singh Libra and Sadhu Singh Dharmsot. For the SAD ticket, those in the race are Makhan Singh Lalka, Inder Iqbal Attwal and Satwinder Kaur Dhaliwal. Promises: The sitting Congress MLA could not get enough funds and his main demand for district status for Nabha went unheeded too. After Preneet Kaur became Patiala MP in 2009, some funds from the MPLAD quota were utilised for development projects on Randeep Singh’s plea. Also, the government lay the foundation stone of a library after Bhai Kahan Singh Nabha at a cost of Rs 80 lakh. But the sanitation and drinking water projects in the inner city remain a distant dream for townsmen. The condition of roads is particularly bad. Garbage dumps in the city speak volumes about the municipal functioning. Despite assurances by the Chief Minister for a fire engine for Nabha, the fire services are in a pathetic state. Vox Populi: “Since we elected a Congress MLA, there was no major development in the area and it is time the government understands that there should be no bias in sanctioning of funds”, said local trader Harpal Singh. “The flow of drugs has increased in the past few years and without any employment opportunities in the town, the youth is directionless”, claimed Sunita Rani, a nurse in a private clinic. While the proposed Bill seeks to provide to the poor rice at Rs 3 per kg and wheat at Rs 2 per kg, Punjab provides wheat (it now provides coarse grain instead of wheat flour) to atta-dal scheme beneficiaries at Rs 4.57 per kg. The atta-dal scheme was initiated by the state government in 2008 by drawing Central Government funds. Under this scheme, beneficiaries are provided 2.5 kg of dal per month at the rate of Rs 25 per kg. “With the Centre coming up with this mega food Bill, the grants meant for all food subsidy schemes will now be used for this single mega food scheme,” said a top official of the Food and Supplies Department, adding that the state government scheme would become redundant. The total population of Punjab is 2.77 crore and just 5.59 per cent (15.50 lakh people) of this population is covered under the atta dal scheme. This state government scheme is meant for BPL families, those covered under the Antodaya Anna Yojana and all other general households with an annual income less than Rs 30,000. 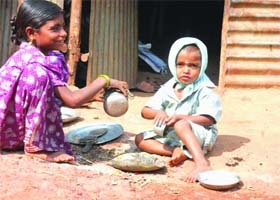 The Centre releases funds for providing subsidised food to 2.50 lakh BPL families. As many as1.79 lakh families are covered under the Antodaya Anna Yojana in Punjab. The state government itself subsidises wheat and pulses provided to those general households with an annual income between Rs 20,000 - Rs 30,000. Comparatively, the new food Bill will cover over 63 per cent of the population, including families living below the poverty line and all general households that receive foodgrain under the public distribution system. At a time when the SAD- BJP government has been flaunting the atta-dal scheme to ensure poll dividends, the Congress-led UPA Government’s announcement of implementing the food Bill for the poor could well steal the SAD-BJP thunder. A senior leader and member of the core committee said that the media coverage of the rally was one of the major issues likely to be taken up at the meeting. Sources close to the CM said the party leadership felt that media reports on the Moga rally had damaged the party’s image at a time when elections were round the corner. “It is time that we draw a new strategy on arrangements for political rallies so that such blunders do not reccur”, said another party leader. Besides, the party is likely to discuss seat adjustments with the BJP. The BJP has summoned its state body meeting on Friday at Jalandhar, which is likely to be presided over by its national president Nitin Gadkari and Shanta Kumar. The SAD is also likely to discuss the poll strategy, particularly for the Malwa belt with 68 of the total 117 constituencies. The SAD leadership may decide the names of at least 50 candidates holding positions as ministers and parliamentary secretaries. The issue of whether or not to give the party ticket to retired bureaucrats, including former DGP Paramdip Singh Gill, may also come up for discussion. “All misunderstanding was removed at a meeting with Manpreet today”, he said. The meeting was held at the residence of former Chief Minister Surjit Singh Barnala. 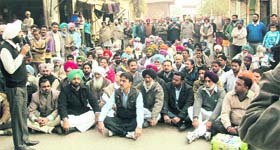 Meanwhile, sources said, the meeting of the Morcha coordination committee would be held at Barnala’s residence. 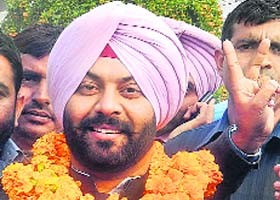 Mann said there was no move by his party whatsoever to join hands with the ruling SAD. It had been reported in a section of the media that Surjit Singh Barnala’s son Gaganjit Singh was keen on joining the Congress. This too was denied by the party spokesman. Regarding Balwant Singh Ramoowalia joining the SAD, Badal said he had not defected to the SAD as he had merged his party with the SAD. He also said that Manpreet Badal had committed a blunder by leaving the SAD. 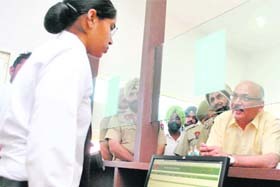 Badal called upon Anna Hazare to take up the cause of strong “anti-defection” law. Badal flayed the Union Government, saying owing to its lenient approach, Naxalism had spread to various parts of the country. Attacks by the terrorists had also increased. The Punjab Government's much-hyped and widely advertised scheme, the Saanjh, initiated in 25 police districts of the state, has become white elephant for the district police due to paucity of funds to meet its daily expenses. With nearly half of the allocated budget still to be released, the police is running from pillar to post to manage its affairs. A Government advertisement released in numerous dailies on Tuesday claimed that 119 Saanjh Kendras were operating in the State providing facilities to the common people. "We have no money to run our vehicles, and sparing finances for the Saanjh scheme is next to impossible", claimed an SSP on the condition of anonymity. According to highly placed sources in the police department, out of the total earmarked budget of Rs 60 crore till date, the first installment of Rs 30 crore was released in 2010 for construction of these centres, while this financial year, less than Rs 3 crore was released. "Senior police officers had suggested the government in 2010 to impose facilitation charges at these Kendras or separately allocate a fixed annual budget for its working, but the Government failed to follow their suggestions and due to which, the day-to-day expenditures are being meted out by the district police from their limited funds", they added. Despite written orders that the Kendra staff would not be deputed for routine duties, district police has no choice but to send them for such duties. "Also we have been told to switch off the LCD screens to save power and save paper cost and scanner ink", claimed a policeman deputed at a centre. The Saanjh Kendras provide all the services enshrined in the Right to Service Act from a single window. These include verification of tenants, registration and verification of servants, passport verification, police clearance certificate, verification of vehicles, character verification for service, payment of traffic challans, information of impounded vehicles, receiving complaints on traffic problems, permission for political/sports/religious functions, NOC for armed licences, permission for use of public address systems etc. The Kendras will also provide a copy of an FIR online. Inaugurated on October 17 by Deputy Chief Minister Sukhbir Singh Badal, the functioning of these Kendras is already in a limbo following acute shortage of funds. "Electricity bills, generator cost, stationary charges and all other expenses are being borne by the district police, which is already short of funds", claimed a senior police officer. SK Sharma, ADGP (HRD & Community Policing), said that he would surely take up the issue with the Government and ensure that there would be no shortage of funds. "No officer from the Kendras should be assigned any other duty or transferred without permission for a minimum of two years", he added. When contacted, Principal Secretary (Home) DS Bains said, "If there is a shortage of funds, the DGP should bring it to the notice of the Government. "I will look into it and necessary funds will be allocated for the Saanjh centres under separate head, so that they can work smoothly", he added. Singh, who belongs to the ruling Shiromani Akali Dal, came to the Commission in reply to a notice the NCW had earlier sent to him to come and explain his conduct. 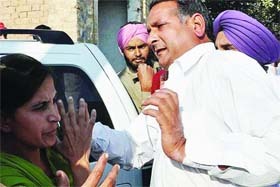 Singh is the sarpanch of Daula village where the incident involving the slapping of Varinder Kaur, a local teacher, took place. Kaur had come to the village to meet the visiting Bathinda MP Harsimrat Kaur Badal, also the wife of Punjab Deputy CM Sukhbir Singh Badal. Mamata Sharma, Chairperson of NCW, today said that though Singh initially resisted accepting that he assaulted the teacher publicly, he later confessed to having committed the crime. "But when we told him the whole world and not just we in India saw him slapping the teacher, he admitted what he had done," Sharma said, adding the NCW would send its report to the Punjab government based on Singh's confessions and statements. Singh was arrested and later bailed out in the case. The Chief Minister held a meeting with a delegation of the agitating teachers, who have been fighting for their demands for the past 22 days, during a public function at a Bathinda village. Moreover, a large number of couples have adopted the terminal method of sterilisation after the birth of either one or two girl children under the Balri Raksha Yojna. Talking to The Tribune, Patiala Civil Surgeon Dr Varinder Singh Mohi informed that the Government had launched Mata Kaushalya Kalyan Yojna a few months back under which any woman who gets her child delivered in government hospital gets Rs 1,000. The department also pays Rs 200 referral transport charges for bringing the patient to hospital at the time of delivery and an additional Rs 600 and Rs 700, respectively, is given to women from urban and rural areas, who are from BPL or reserved categories. "In the past five years, the number of deliveries in government institutes has doubled and the average number of deliveries in a month is increasing with each month," added Dr Mohi. Highlighting the benefits being drawn by various couples under the Balri Rakshi Yojna, he further informed that an incentive of Rs 500 per month was being given to the female child provided the parents adopt terminal method of sterilization after the birth of only one girl. He said, "An incentive of Rs 1,000 (Rs 500+Rs 500) is given for two girls provided the family adopts terminal method of sterilization after the birth of the second girl-child (only if the first child is also a girl) and the incentive is given till the age of 18 years unless the beneficiary becomes an income tax payer. Almost 50 couples in Patiala alone are drawing the benefit under this scheme, which indicates the success of the scheme." Meanwhile, a district-level Maternal and Child Health workshop and free medical camp for pregnant women was organised in Badungar slum area today in which gynaecologist Dr Daljit Kaur examined 165 women, paediatrician Dr Rajiv Tondon treated 115 children and medical officer Dr Nirmal Singh checked 200 patients. Disclosing this, Dr JP Singh, Director, Health, Punjab said, "This is the project of the Central Government and we have received guidelines related to it. We are still formulating it while keeping in view our State. SK Sharma, Managing Director, The Neonatal National Rural Health Mission, is taking care of this project. I think it would be implemented soon." According to higher officers of the department, "It will invoke new approach to healthcare and will help in checking the mortality rate of newborns in the State." Under this project, a sick neonatal would be entitled to free treatment besides free transport, both ways and between facilities in case of referral. The initiative would benefit more than a crore women and sick newborns at present accessing the public health services every year. It would further trigger enhanced demand for care in public health institutions, as over 70 lakh women still prefer home delivery. Dr Rajinder Gulati, former President, Indian Academy of Paediatrics, Punjab, and national trainer for Navjat Shishu Suraksha Karyakram, said, "This project will indeed be very helpful in checking the mortality rate of neonatal. Although institutional deliveries have increased but the neonatal mortality is not showing much improvement as many mothers used to leave the hospital with the newborn at the earliest and their stay do not exceed more than 24 to 48 hours. The reason behind this is their high personal expenses. But now the infants have been safeguarded for the first 30 days after birth because they will be managed free of cost in case any health problem arises." In Haryana, there was a noticeable improvement in the night temperature in Rohtak district, which was recorded at 4 degrees Celsius. The minimum temperature on Sunday was recorded at 1.6 degrees Celsius at Rohtak and Hisar. The Met officials said that cold day conditions would prevail in some parts of the State and likely to continue during next 48 hours. Weather has been dry in the State. The minimum temperature recorded in Manali in Himachal Pradesh was at 1.6 degrees Celsius, while in Jammu and Kashmir it was -3 degree Celsius in Srinagar. The weather officials said that the night temperature in the state of Punjab increased noticeably and was normal. The sky would remain cloudy in various parts of Punjab and Haryana with fog or mist occurring in the two states. Giving information, Sewa Singh, President of the Km-Scheme Bus Owners' Union, said that there were around 283 buses under the km scheme, but the PRTC had failed to make the payment to bus owners even after more that six months. "In many cases, the PRTC has not paid the money for the past eight months and as a result owners are finding it difficult to pay the bank installments and maintain their buses," he added. He further said that as per the agreement between the PRTC and the km-scheme bus owners, the management was to pay Rs 6.59 per km to the bus owner every fortnight and in case the bus was off road, the owner was supposed to pay a daily fine to the PRTC. He said, "As per the contract, the PRTC is imposing a fine of Rs 800 to Rs 1,000 on km-scheme buses, but they are ignoring the fact that even they have to make fortnightly payments to the owners." "Almost all owners have taken loans to purchase buses and few of them have already received notices from banks as they could not pay the installments," added Sewa Singh. When contacted, PRTC Chairman Ranjit Singh Balian said that they had already distributed some amount amongst their employees. "We have got the remaining amount and will clear all their pending dues within one to two days," he added. Giving information, Dr Gurmeet Singh Maan, Director of Advanced Media Studies, informed that the Punjab Government had recently implemented the mobile phone allowance for all its employees. "Moreover, the varsity has increased the house rent from 15 per cent to 20 per cent for its employees and decided to give both the facilities on par with the Government employees," he added. He informed that the employees would be given Rs 500 per month as phone allowance. Appreciating the decision of the university authorities, employees said, "One has to make multiple calls for official work and one cannot always use the landline phone."